The habitat setup and maintenance is most important to the success of your discus aquarium. You must monitor your tank constantly to assure the correct water temperature and pH level so that your discus family remains happy and healthy. Discus are happiest when they are together in a group of at least 6 fish. You can add other fish to your aquarium tank, but mixing the wrong species can have a devastating effect on your discus population. For instance, angelfish, in spite of their angelic name, are very aggressive when it comes to feeding. Discus are much more shy. So it is not recommended that you mix these two types of fish. The discus will suffer from being underfed and will hide from more aggressive tank-mates. On the other hand, schooling fish such as tetras or characins can have a calming effect on your discus population and result in a happier “society” of fish. Can you have less than 6 discus? Absolutely, just remember that each adult discus requires 10-15 gallons of “space” to maintain optimum conditions. And, as already mentioned, discus are social and they will be happier if there is a group rather than just one or two of them. As a rule of thumb, you should plan for 10-15 gallons per adult discus. That means that a minimum of 55 gallon tank would be needed for a group of 6 adults (I know, the math says 60 gallons, but 55 is a common sized aquarium). Monitoring the water in your aquarium is very important. Important aspects of tank water include the pH, temperature, and softness. While most folks are now buying their discus from dealers who have raised them on discus “farms”, if you get wild discus, they will have come from very different surroundings. The water in the Amazon River (their natural habitat) is quite muddy, making it much darker than a clean, open aquarium. Discus which are spawned in captivity are not used to dark water, so you can use a more “regular” tank setup with lights, artificial substrate, and filters. But even domestic raised discus will need tank water kept at the right temperature, 77-85°F (25-29°C), and pH, between 6.0 and 6.5. Changing the water is also quite important as you maintain your tank conditions. Do not make the mistake of changing ALL the water at one time. Beginning aquarists are prone to this mistake. Frequent water change includes replacing about 25% of the water at least once per week. If you have spawning fish, water changes should be more frequent. Breeders always have bare-bottom tanks to raise their fish, and there are many who claim that the best habitat for discus is a bare tank. 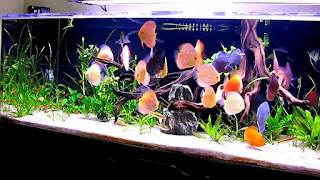 However, there is no reason, other than convenience for cleaning, that you can’t have a planted aquarium. Plants do help with the nitrate level, and, of course, they are part of the discus natural habitat. Just make sure you get your plants from a reliable source so that they are free from contaminants. Here again, you will want to steer clear of general, all-purpose pet stores that do not specialize in aquarium fish. Here is a little video that shows how your tank can look with a bit of attention to detail and some healthy discus fish! Notice how beautiful healthy discus are. It is so relaxing to sit and watch these gorgeous creatures with some music playing in the background.